Boosterism is the act of promoting ("boosting") a town, city, or organization, with the goal of improving public perception of it. Boosting can be as simple as talking up the entity at a party or as elaborate as establishing a visitors' bureau. It has been somewhat associated with American small towns. Boosting is also done in political settings, especially in regard to disputed policies or controversial events. Otis Chandler was the publisher of the Los Angeles Times between 1960 and 1980, leading a large expansion of the newspaper and its ambitions. 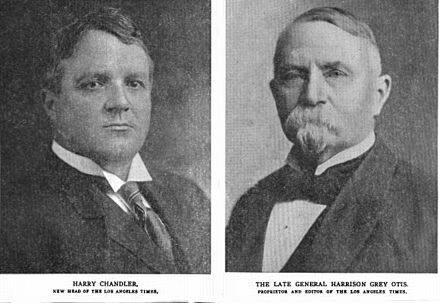 He was the fourth and final member of the Chandler family to hold the paper's top position. Los Angeles International Airport, locally referred to as LAX, is the primary international airport serving Los Angeles, California. The Times was first published on December 4, 1881, as the Los Angeles Daily Times under the direction of Nathan Cole Jr. and Thomas Gardiner. It was first printed at the Mirror printing plant, owned by Jesse Yarnell and T.J. Caystile. Unable to pay the printing bill, Cole and Gardiner turned the paper over to the Mirror Company. In the meantime, S. J. Mathes had joined the firm, and it was at his insistence that the Times continued publication. In July 1882, Harrison Gray Otis moved from Santa Barbara to become the paper's editor. Otis made the Times a financial success. Nathan Cole Jr. (1860–1921) was one of the two founders of the Los Angeles Daily Times, now the Los Angeles Times. The son of a wealthy St. Louis, Missouri politician and banker, he was just 21 years old in 1881 when he and a colleague, Thomas Gardiner, put together the first issues of the new venture to be printed on the presses of the Mirror Publishing Company. Later he was a real estate man and a Los Angeles city police commissioner. Thomas Gardiner (1826–1899) was the manager of the San Diego Union and a founder of the Los Angeles Daily Times, precursors to today's San Diego Union-Tribune and Los Angeles Times, respectively. Thomas Jesse Yarnell, known as Jesse Yarnell, (1837–1906) was a California newspaperman who established the Los Angeles, California, Weekly Mirror, which took over the Los Angeles Times in 1881 and later merged with it. Kevin Owen Starr was an American historian and California's State Librarian, best known for his multi-volume series on the history of California, collectively called "Americans and the California Dream." 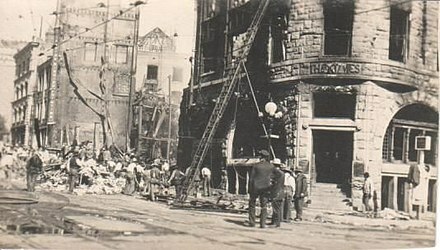 The Los Angeles Times bombing was the purposeful dynamiting of the Los Angeles Times Building in Los Angeles, California, on October 1, 1910, by a union member belonging to the International Association of Bridge and Structural Iron Workers. The explosion started a fire which killed 21 newspaper employees and injured 100 more. It was termed the "crime of the century" by the Times. The American Federation of Labor (AFL) was a national federation of labor unions in the United States founded in Columbus, Ohio, in December 1886 by an alliance of craft unions disaffected from the Knights of Labor, a national labor union. Samuel Gompers of the Cigar Makers' International Union was elected president at its founding convention and reelected every year, except one, until his death in 1924. The A.F. of L was the largest union grouping in the United States for the first half of the 20th century, even after the creation of the Congress of Industrial Organizations (CIO) by unions which were expelled by the AFL in 1935 over its opposition to industrial unionism. The Federation was founded and dominated by craft unions throughout its first fifty years, after which many craft union affiliates turned to organizing on an industrial union basis to meet the challenge from the Congress of Industrial Organizations (CIO) in the 1940s. Clarence Seward Darrow was an American lawyer, a leading member of the American Civil Liberties Union, and a prominent advocate for Georgist economic reform. He defended high-profile clients in many famous trials of the early 20th century, including teenage thrill killers Leopold and Loeb for murdering 14-year-old Robert "Bobby" Franks (1924); teacher John T. Scopes in the Scopes "Monkey" Trial (1925), in which he opposed statesman and orator William Jennings Bryan; and Ossian Sweet in a racially charged self-defense case (1926). Called a "sophisticated country lawyer", Darrow's wit and eloquence made him one of the most prominent attorneys and civil libertarians in the nation. Gordon Bernie Kaufmann was an English-born American architect mostly known for his work on the Hoover Dam. The fourth generation of family publishers, Otis Chandler, held that position from 1960 to 1980. Otis Chandler sought legitimacy and recognition for his family's paper, often forgotten in the power centers of the Northeastern United States due to its geographic and cultural distance. He sought to remake the paper in the model of the nation's most respected newspapers, notably The New York Times and The Washington Post . Believing that the newsroom was "the heartbeat of the business",  Otis Chandler increased the size and pay of the reporting staff and expanded its national and international reporting. In 1962, the paper joined with The Washington Post to form the Los Angeles Times–Washington Post News Service to syndicate articles from both papers for other news organizations. He also toned down the unyielding conservatism that had characterized the paper over the years, adopting a much more centrist editorial stance. John Carroll, former editor of the Baltimore Sun , was brought in to restore the luster of the newspaper. During his reign at the Times he eliminated more than 200 jobs, but despite an operating profit margin of 20 percent, the Tribune executives were unsatisfied with returns, and by 2005 Carroll had left the newspaper. His successor, Dean Baquet, refused to impose the additional cutbacks mandated by the Tribune Company. Baquet was the first African-American to hold this type of editorial position at a top-tier daily. During Baquet and Carroll's time at the paper, it won 13 Pulitzer Prizes, more than any other paper but The New York Times. However, Baquet was removed from the editorship for not meeting the demands of the Tribune Group—as was publisher Jeffrey Johnson—and was replaced by James O'Shea of the Chicago Tribune. O'Shea himself left in January 2008 after a budget dispute with publisher David Hiller. On January 19, 2018, employees of the news department voted 248–44 in a National Labor Relations Board election to be represented by the NewsGuild-CWA. The vote came despite aggressive opposition from the paper's management team, reversing more than a century of anti-union sentiment at one of the biggest newspapers in the country. Times journalist David Willman won the 2001 Pulitzer Prize for Investigative Reporting; the organization cited "his pioneering expose of seven unsafe prescription drugs that had been approved by the Food and Drug Administration, and an analysis of the policy reforms that had reduced the agency's effectiveness." In 2004, the paper won five prizes, which is the third-most by any paper in one year (behind The New York Times in 2002 (7) and The Washington Post in 2008 (6)). By the mid-1940s, the Times was the leading newspaper in terms of circulation in the Los Angeles metropolitan area. In 1948, it launched the Los Angeles Mirror, an afternoon tabloid, to compete with both the Daily News and the merged Herald-Express. In 1954, the Mirror absorbed the Daily News. The combined paper, the Mirror-News, ceased publication in 1962, when the Hearst afternoon Herald-Express and the morning Los Angeles Examiner merged to become the Herald-Examiner . The Herald-Examiner published its last number in 1989. In 2014, the Los Angeles Register, published by Freedom Communications, then-parent company of the Orange County Register was launched as a daily newspaper to compete with the Times. By late September of the same year, the Los Angeles Register was folded. Among the Times' staff are columnists Steve Lopez and Patt Morrison, television critic Mary McNamara and film critic Kenneth Turan. Sports columnists include Bill Plaschke, who is also a panelist on ESPN's Around the Horn , and Helene Elliott, the first female sportswriter to be inducted into the Hockey Hall of Fame. From 1967 to 1972, the Times produced a Sunday supplement called West magazine. West was recognized for its art design, which was directed by Mike Salisbury (who later went on to become art director of Rolling Stone magazine). From 2000 to 2012, the Times published the Los Angeles Times Magazine , which started as a weekly and then became a monthly supplement. The magazine focused on stories and photos of people, places, style, and other cultural affairs occurring in Los Angeles and its surrounding cities and communities. Since 2014, The California Sunday Magazine has been included in the Sunday L.A. Times edition. After a seven-year hiatus from the medium, the firm reactivated Times-Mirror Broadcasting Company with its 1970 purchase of the Dallas Times Herald and its radio and television stations, KRLD-AM-FM-TV in Dallas. The Federal Communications Commission granted an exemption of its cross-ownership policy and allowed Times-Mirror to retain the newspaper and the television outlet, which was renamed KDFW-TV. Times-Mirror Broadcasting later acquired KTBC-TV in Austin, Texas in 1973;  and in 1980 purchased a group of stations owned by Newhouse Newspapers: WAPI-TV (now WVTM-TV) in Birmingham, Alabama; KTVI in St. Louis; WSYR-TV (now WSTM-TV) in Syracuse, New York and its satellite station WSYE-TV (now WETM-TV) in Elmira, New York; and WTPA-TV (now WHTM-TV) in Harrisburg, Pennsylvania. The company also entered the field of cable television, servicing the Phoenix and San Diego areas, amongst others. They were originally titled Times-Mirror Cable, and were later renamed to Dimension Cable Television. Similarly, they also attempted to enter the pay-TV market, with the Spotlight movie network; it wasn't successful and was quickly shut down. The cable systems were sold in the mid-1990s to Cox Communications. Times-Mirror also pared its station group down, selling off the Syracuse, Elmira and Harrisburg properties in 1986. The remaining four outlets were packaged to a new upstart holding company, Argyle Television, in 1993. These stations were acquired by New World Communications shortly thereafter and became key components in a sweeping shift of network-station affiliations which occurred between 1994–1995. 2 Purchased along with KRLD-AM-FM as part of Times-Mirror's acquisition of the Dallas Times Herald . Times-Mirror sold the radio stations to comply with FCC cross-ownership restrictions. The Daily Californian is an independent, student-run newspaper that serves the University of California, Berkeley campus and its surrounding community. It publishes a print edition four days a week on Monday, Tuesday, Thursday, and Friday during the academic year, and twice a week during the summer. Established in 1871, The Daily Californian is one of the oldest newspapers on the West Coast, and one of the oldest college newspapers in the United States. Current circulation is about 10,000 for a campus of roughly 35,000 students. The St. Louis Post-Dispatch is the major regional newspaper in St. Louis, Missouri, serving St. Louis City and County, St. Charles County, the Metro East and surrounding counties. It is the only daily newspaper in the city. The publication has received 19 Pulitzer Prizes. Dan Neil is an automotive columnist for The Wall Street Journal and a former staff writer at the Los Angeles Times, AutoWeek and Car and Driver. He was a panelist on 2011's The Car Show with Adam Carolla on Speed Channel. 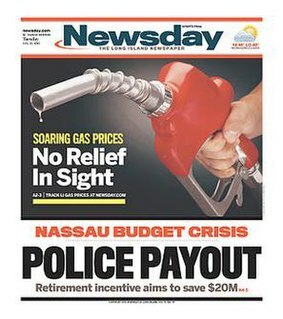 Newsday is an American daily newspaper that primarily serves Nassau and Suffolk counties and the New York City borough of Queens on Long Island, although it is also sold throughout the New York metropolitan area. As of 2009, its weekday circulation of 377,500 was the 11th-highest in the United States, and the highest among suburban newspapers. In 2012, Newsday expanded to include Rockland and Westchester county news on its website. As of January 2014, Newsday's total average circulation was 437,000 on weekdays, 434,000 on Saturdays and 495,000 on Sundays. 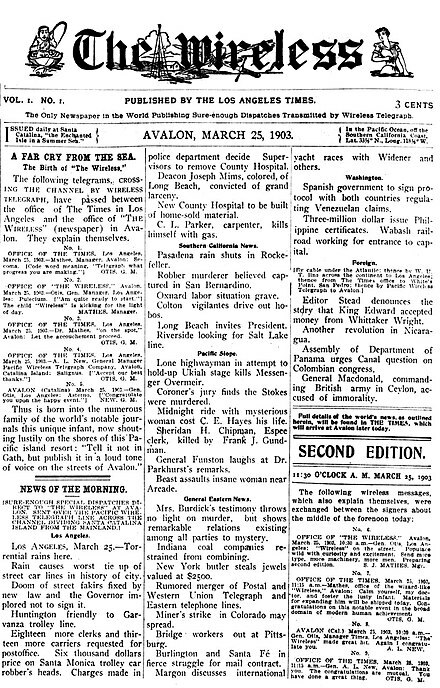 The Los Angeles Herald Examiner was a major Los Angeles daily newspaper, published Monday through Friday in the afternoon and in the morning on Saturdays and Sundays. It was part of the Hearst syndicate. The afternoon Herald-Express and the morning Examiner, both of which had been publishing in the city since the turn of the 20th century, merged in 1962. For a few years after this merger, the Herald Examiner claimed the largest afternoon-newspaper circulation in the country. The Daily Princetonian is the award-winning daily independent student newspaper of Princeton University. Founded in 1876 and daily since 1892, the Princetonian is among the oldest college newspapers in the country. Its alumni have pursued careers in journalism at The New York Times, The Washington Post, The Wall Street Journal and have won the Pulitzer Prize. The Daily Northwestern is the student newspaper at Northwestern University which is published on weekdays during the academic year. Founded in 1881, and printed in Evanston, Illinois, it is staffed only by undergraduates, many of whom are students at Northwestern's Medill School of Journalism. The Orange County Business Journal is a weekly print and online newspaper covering business in Orange County, California. The paper is the second largest business journal in California after the Los Angeles Business Journal. The Post is a student-run newspaper in Athens, Ohio, that covers Ohio University and Athens County. While classes at OU are in session, it publishes online every day and in print every Thursday. Though its newsroom is located in John Calhoun Baker University Center at Ohio University, the paper is editorially independent from the university. ↑ "The 10 Most Popular Daily Newspapers In The United States" . Retrieved October 24, 2017. 1 2 3 Arango, Tim (2018-06-18). "Norman Pearlstine Named Editor of The Los Angeles Times". The New York Times. Retrieved 2018-06-18. ↑ Arango, Tim; Nagourney, Adam (2018-01-30). "A Paper Tears Apart in a City That Never Quite Came Together". The New York Times. ISSN 0362-4331 . Retrieved 2019-04-03. ↑ Chang, Andrea (April 17, 2018). "L.A. Times will move to 2300 E. Imperial Highway in El Segundo". Los Angeles Times. Retrieved July 19, 2018. ↑ "Biotech billionaire takes control of the LA Times, names new executive editor". Orange County Register. Associated Press. June 18, 2018. Retrieved July 19, 2018. ↑ Curwen, Thomas (20 July 2018). "For a brief, shining moment, Times Mirror Square was L.A.'s Camelot". Los Angeles Times. Retrieved 21 July 2018. ↑ Miranda, Carolina (17 July 2018). "Ugly carpets and green marble: The design of the Los Angeles Times buildings changed along with the city, though not always gracefully". Los Angeles Times. Retrieved 21 July 2018. 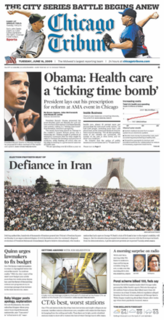 ↑ "Tribune called on to sell L.A. Times". CNN . September 18, 2006. Retrieved June 19, 2012. ↑ "Tribune goes to Zell". Chicago Sun-Times . April 3, 2007. 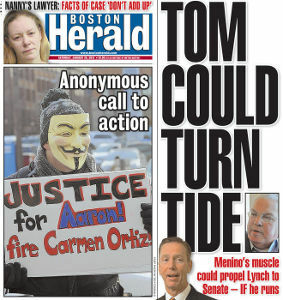 Archived from the original on September 18, 2008. ↑ Koren, Meg James, James Rufus. "Billionaire Patrick Soon-Shiong reaches deal to buy L.A. Times and San Diego Union-Tribune". latimes.com. Retrieved 2018-02-08. ↑ "Tronc in Talks to Sell Flagship Los Angeles Times to Billionaire Investor". February 6, 2018. Retrieved February 6, 2018. ↑ "Tronc Pushes Into Digital Future After Los Angeles Times Sale". February 7, 2018. Retrieved February 7, 2018. ↑ James, Meg; Chang, Andrea (April 13, 2018). "Patrick Soon-Shiong plans to move Los Angeles Times to new campus in El Segundo". Los Angeles Times. Retrieved 13 April 2018. ↑ TJ Sullivan (January 13, 2009). 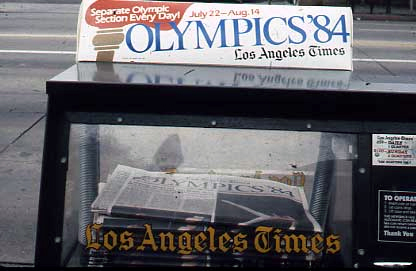 "Los Angeles Times Ups Newsstand Price". Nbclosangeles.com. Retrieved August 8, 2016. ↑ Roderick, Kevin (January 30, 2009). "Los Angeles Times kills local news section". LA Observed. Retrieved August 8, 2016. ↑ Mullin, Benjamin (October 5, 2015). "Tribune Publishing CEO announces buyouts". Poynter. Archived from the original on December 8, 2015. Retrieved August 8, 2016. ↑ "For the 'funemployed,' unemployment is welcome". LA Times. June 4, 2009. Retrieved August 8, 2016. ↑ James, Meg (August 21, 2017). "Ross Levinsohn is named the new publisher and CEO of the L.A. Times as top editors are ousted" . Retrieved August 21, 2017. ↑ Ember, Sydney (2018). "Union Is Formed at Los Angeles Times and Publisher Put on Leave". The New York Times. ISSN 0362-4331 . Retrieved 2018-01-20. ↑ Bill Cromwell (April 26, 2010). "Like Newspaper Revenue, the Decline in Circ Shows Signs of Slowing". editorandpublisher.com. Archived from the original on October 25, 2010. Retrieved April 26, 2010. ↑ "The Los Angeles Times' history". Los Angeles Times. ISSN 0458-3035 . Retrieved May 15, 2017. 1 2 Saar, Mayrav (January 26, 2007). "LAT's Scathing Internal Memo. Read It Here". FishbowlLA. mediabistro.com. Archived from the original on October 30, 2007. ↑ Ives, Nate (February 13, 2008). "Los Angeles Times Launches Free Weekly". Advertising Age . Retrieved October 3, 2013. ↑ Petroff, Alanna. "LA Times takes down website in Europe as privacy rules bite". CNN. ↑ Newcomb, Alyssa (25 May 2018). "Chicago Tribune, Los Angeles Times block European users due to GDPR". CBS News . NBC Universal . Retrieved 8 June 2018. ↑ Stewart, Jill (October 14, 2003). "How the Los Angeles Times Really Decided to Publish its Accounts of Women Who Said They Were Groped". jillstewart.net. Archived from the original on February 1, 2008. ↑ "ASNE recognizes Los Angeles Times editor for leadership". ASNE.org. American Society of Newspaper Editors. March 24, 2004. Archived from the original on November 15, 2007. ↑ "LA Times Fires Longtime Progressive Columnist Robert Scheer". Democracy Now!. Retrieved 2018-10-15. ↑ Carroll, Rory (2017-11-07). "Disney's blackout of LA Times triggers boycott from media outlets". The Guardian. ISSN 0261-3077 . Retrieved 2017-11-07. ↑ "Why I won't be reviewing 'The Last Jedi,' or any other Disney movie, in advance". Washington Post. Retrieved 2017-11-07. ↑ Carroll, Rory (2017-11-07). "Disney ends blackout of LA Times after boycott from media outlets". The Guardian. ISSN 0261-3077 . Retrieved 2017-11-07. ↑ "The 1984 Pulitzer Prize Winner in Public Service". The Pulitzer Prizes. Retrieved 2018-07-22. ↑ "The Pulitzer Prizes | Citation". www.pulitzer.org. Retrieved November 13, 2015. ↑ "Harrison Gray Otis Southern California Historical Society". Socalhistory.org. May 25, 2016. Archived from the original on October 2, 2015. Retrieved August 8, 2016. ↑ The four pages of the debut March 25, 1903 issue of The Wireless were reproduced on page 11 of the March 27, 1903 Times. ↑ "The Wireless Daily Achieved" by C. E. Howell, The Independent, October 15, 1903, pages 2436-2440. ↑ "Los Angeles Times Community Newspapers Add New Title, Increase Coverage and Circulation with Sunday News-Press & Leader". Los Angeles Times. January 12, 2011. Los Angeles Times Community Newspapers (TCN) include the Glendale News-Press, Burbank Leader, La Cañada Valley Sun, Huntington Beach Independent, Daily Pilot (Costa Mesa, Newport and Irvine) and Laguna Beach Coastline Pilot. TCN newspapers maintain separate editorial and business staffs from that of The Times, and focus exclusively on in-depth local coverage of their respective communities. ↑ "The Pasadena Sun Publishes Last Issue". Editor & Publisher . July 1, 2013. ↑ Heller, Steven. "Go West, Young Art Director," Design Observer (Sept. 23, 2008). 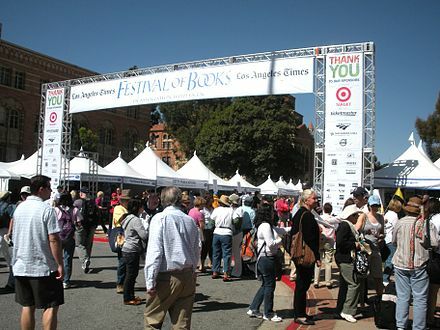 ↑ "Los Angeles Times Festival of Books" . Retrieved October 6, 2014. ↑ rebecca Buddingh (September 26, 2010). "L.A. Times fair comes to USC". Daily Trojan. University of Southern California. Retrieved October 21, 2012. ↑ "Los Angeles Times Book Prizes home page" . Retrieved October 6, 2014. ↑ Storch, Charles (June 27, 1986). "Times Mirror Selling Dallas Times Herald". Chicago Tribune . Retrieved June 26, 2012. ↑ "Johnson family sells Austin TV." [ permanent dead link ] Broadcasting , September 4, 1972, pg. 6. ↑ "Times Mirror's deal for Newhouse's TVs gets FCC approval." [ permanent dead link ]Broadcasting, March 31, 1980, pg. 30. ↑ "Changing hands: Proposed." [ permanent dead link ]Broadcasting, September 30, 1985, pg. 109. ↑ "Times Mirror set to sell four TV'." Archived June 9, 2015, at WebCite Broadcasting and Cable, March 22, 1993, pg. 7. Prochnau, William (January–February 2000). 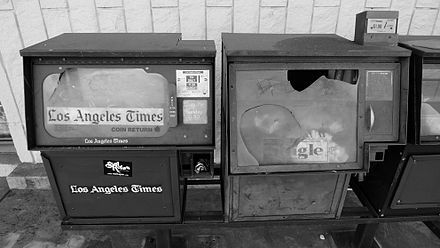 "The State of The American Newspaper: Down and Out in L.A." American Journalism Review . College Park: University of Maryland Foundation. Wikimedia Commons has media related to Los Angeles Times .